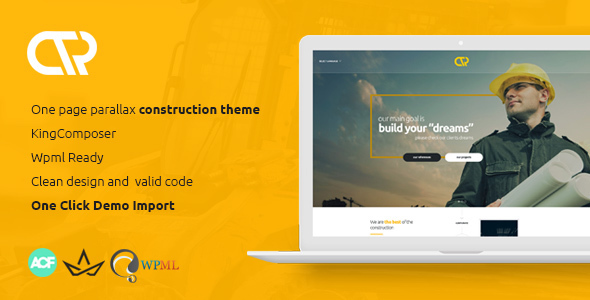 Consta is one page construction WordPress theme. This WordPress theme built for Construction, Architecture, Renovation, Building Services, Engineering and other construction related services.It is also suitable for any kind of small business activity: Maintenance, Painting, Decorating, Partitions u0026amp; Ceilings, Plastering and Rendering, Flooring, Plumbing and etc. TEMPLATE FEATURES Drap and drop consta page builder. KingComposer page builder. King Pro Included – Saving 19$ ACF Pro Included – Saving 25$ Contact Form7 Plugin Included Theme Options with WordPress Customizer Translation and WPML ready Custom Widgets Custom Google Map Demo Content . Consta has been tested with browsers IE9, IE10, IE11, Firefox, Safari, Opera, Chrome.